Kids looking for something fun to do will find plenty of ideas in an assortment of hands-on volumes. 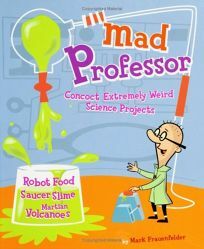 With crisp, retro comic illustrations, Mad Professor: Concoct Extremely Weird Science Projects by Mark Frauenfelder entices youngsters to create ""Robot Food,"" ""Goon Goo"" and ""Top-Secret Ink."" Four sections explore polymer science, robotics, earth science and the significance of the scientific method; each experiment calls for common household items. Spiral binding and acetate pages facilitate experimentation.